which represented a moderate rebound after a 3% setback in 2017.
stores, hotels, warehouses, commercial garages, and multifamily housing. 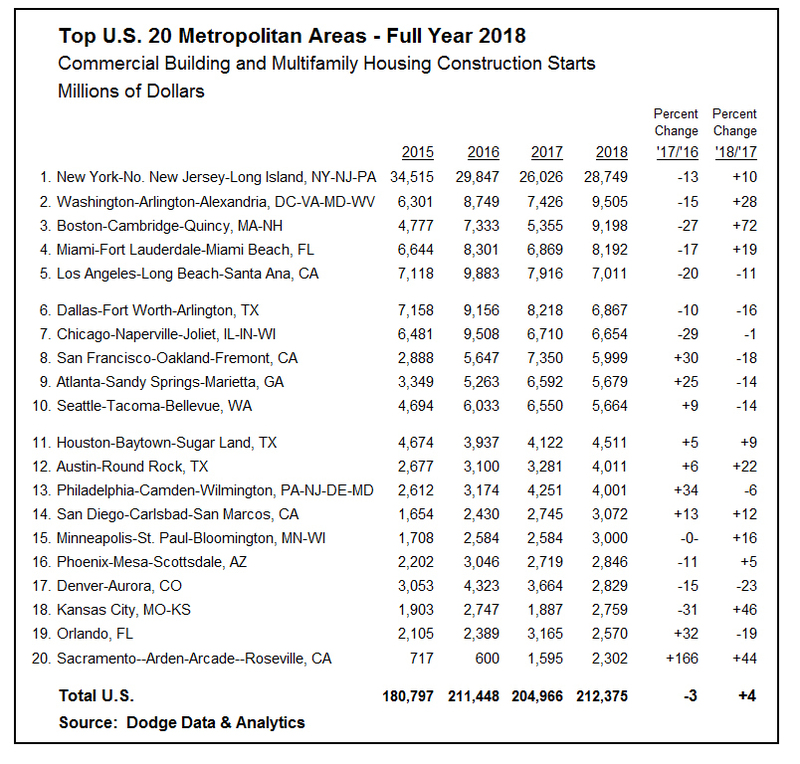 increase for commercial and multifamily construction starts at the U.S.
shown slight improvement, edging up 1% in both 2017 and 2018.
stated Robert A. Murray, chief economist for Dodge Data & Analytics. same as the 24 such projects that reached groundbreaking in 2017. $185 million Apex residential towers in Bethesda. improved 38% in 2018, while warehouse construction starts retreated 26%. $188 million 159 Washington St. multifamily complex. starts advanced 21%, lifted by the $139 million office portion of Ft.
Conference Center in Aventura FL. housing in 2018 showed activity rebounding after a 20% decline in 2017.
million Davis apartment complex in Frisco. 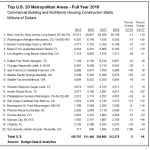 commercial building almost offset that decline with a 31% increase. starts, down 13%; and hotel construction starts, down 18%. million Menlo Gateway Park office complex, both located in Menlo Park. the $200 million Franklin Street apartment tower. in Bellevue and the $100 million Dexter Yard office complex in Seattle. Street multifamily tower, all located in Seattle.